We explore the differences and break down some of the most common questions we get. About a year ago, we took a pretty in-depth look at the difference between the GS3 AV and MP. We talk to machine users and espresso enthusiasts every day, and one question that consistently comes up is “what’s the difference between the GS3 and the Linea Mini?” Because it’s such a common question, it drives many of the conversations we have about espresso. So, we took some time to break it down a bit, and to talk through some of the functionality each machine gives you. Whether you’re a home barista exploring an upgrade for your passion and hobby or a major roaster using your machine for experimentation and pop-up events, this latest post will help get you started in the right direction. La Marzocco produces two versions of the GS3—the AV (auto-volumetric) and the MP (manual paddle), and one version of the Linea Mini. At its most basic, the Linea Mini is a completely analog machine while the GS3 is a digital machine that comes in two versions—the AV & the MP. There are a lot of similarities between the two machines. They’re both handmade by La Marzocco in Florence, Italy. They each use many of the same materials and parts as our commercial espresso machines. And they’re both full-performance, dual-boiler professional espresso machines with PID, internal rotary pump, and incredible steam power. Both machines are incredibly consistent across all major brewing variables, which really allow you to focus on what’s important—the taste of the coffee. From there, it all comes down to how you like to prepare your espresso. With that in mind, let’s take a look at each machine. Created and launched in 2015, the Linea Mini is inspired by one of our most popular machines—the Linea Classic. Over the years, thousands of professional baristas have been trained on the Linea Classic and have used it as the heart and soul of the cafe. A true workhorse. 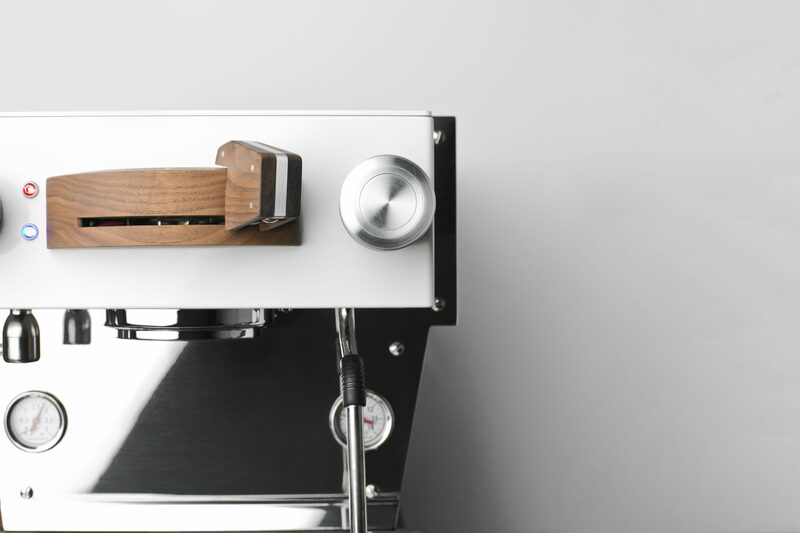 To put it simply, the Linea Mini is an analog machine created for the espresso purist. It brews espresso and steams milk to perfection, without all the forward-facing configurations and variables on a digital machine. It’s just you and the machine…and any barista skills you bring to the table. In fact, the only variable you can outwardly change on the machine is temperature. The simplicity of this machine is actually one of the things we love the most about it. Although it’s an analog machine with a limited number of variables to control, the Linea Mini is rock-solid internally with a digital-PID system, and follows the same professional & commercial builds as the entire La Marzocco line. From off to full coffee-brewing temperature, the Linea Mini is ready to go in about 10 minutes, with full-steaming capacity available in about 15 minutes. It runs on 120V of electricity, comes with its own 2 liter water reservoir (with an easily removable reservoir lid), and has a footprint of 14” x 15” x 21”. Internally, the Linea Mini holds a 3.5 liter steam boiler—which means powerful steam that can handle a large quantity of drinks. In fact, we’ve put the Linea Mini to the task at high-volume events such as TED and SCA Expo and have found that as long as we had water in the reservoir, the Linea Mini kept up with no drop in steam power. 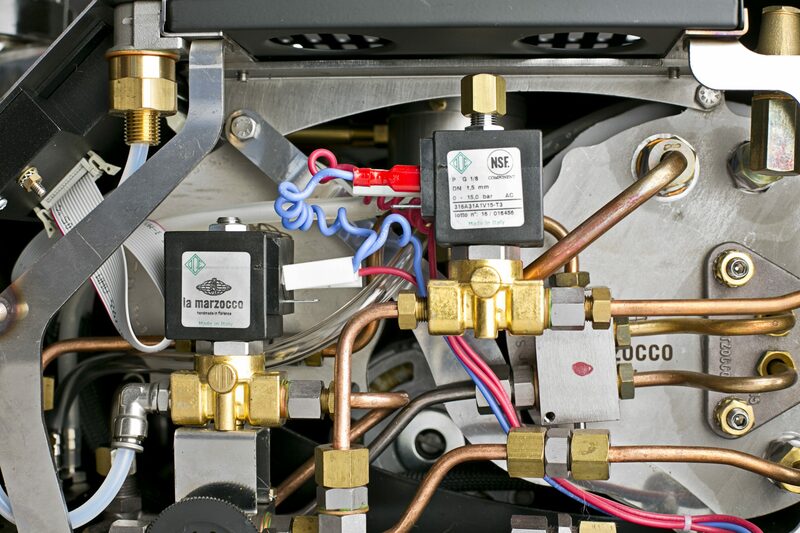 The grouphead and boiler on the Linea Mini is slightly different than any group/boiler combo in our lineup, and as a result, this allows the machine to achieve the temperature stability and energy efficiency of our commercial machines, but in a much smaller footprint—and in a much quicker time. Rather that heating up an entire larger boiler full of water and regulating it, the Integrated Grouphead and boiler heats only what it needs. 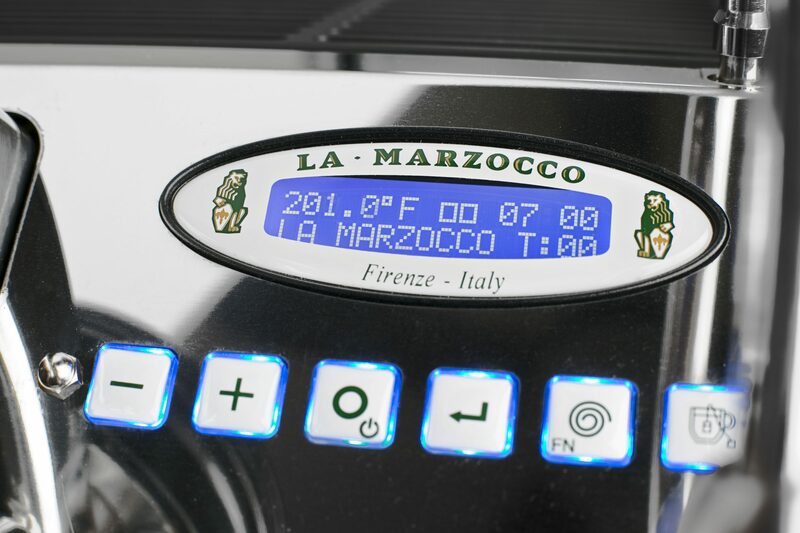 One advantage to this is that by combining the smaller group technology with an accurate and dialed-in PID algorithm, temperature changes are nearly instantaneous on the Linea Mini. As a barista at home, this means rock-solid temperature stability & pressure stability from shot to shot. No more surfing. Outwardly, the Linea Mini controls are simple & easy to use, and take their design nods from past versions of the Linea Classic. For coffee brewing, the Linea Mini utilizes an EE paddle—the paddle activates a microswitch which engages the pump and begins the brewing process—a simple on/off action. Once you turn the paddle, the switch engages, and the brewing process begins. Built into the brewing process on the Linea Mini is a two second pre-infusion—so, once you pull the paddle, your puck will receive a quick splash of water just before the pressure builds. 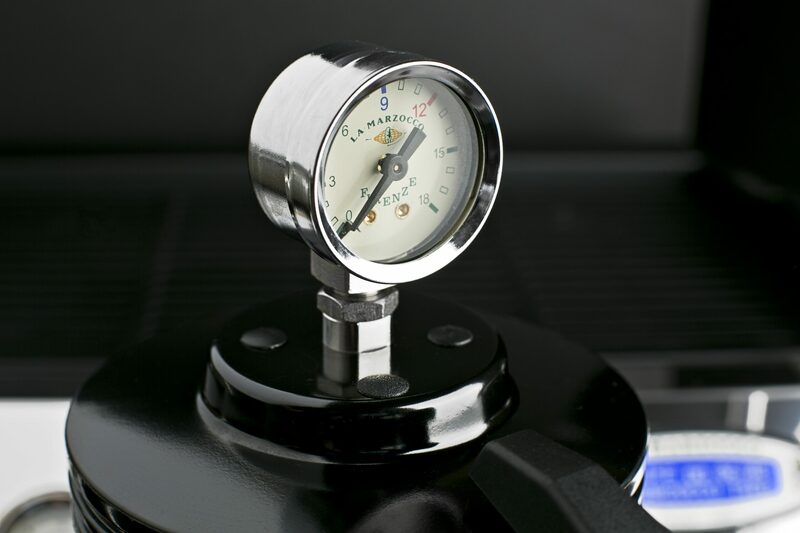 While pump pressure can be adjusted for on the inside of the machine using a few tools and a little know-how, pre-infusion cannot be adjusted for. Two indicator lights next to the Paddle show water level (blue) and heating (red). A solid blue light indicates the water level in the reservoir is sufficient, while a flashing blue light indicates that water needs to be added. If the water level drops below the required level during the brewing process, the Linea Mini will continue to brew up to 30 seconds. So, you don’t have to worry about it stopping mid-shot. A solid red light indicates the coffee boiler is up to temperature, and a flashing red light means the coffee boiler is heating up. Left of the paddle and Indicator Lights, the Linea Mini has a hot water knob that dispenses 212 F water directly from the steam boiler. Right of the paddle is a matching knob that controls the steam wand directly below it. With a progressive steam valve, steaming on the Linea Mini is almost identical to steaming on the Linea Classic; high-powered and fast. As you turn the knob, the valve opens more and more, which means easy and quick steam power control without having to get into the boiler or change boiler temperature. If you’ve ever steamed on a Linea Classic or Linea PB, you’ll find these controls very similar. Between the large boiler, progressive valve, and steam wand, steaming milk on the Linea Mini is incredibly fast and easy—producing silky-smooth milk in about 7 seconds, which is as fast as you’ll find in any cafe. 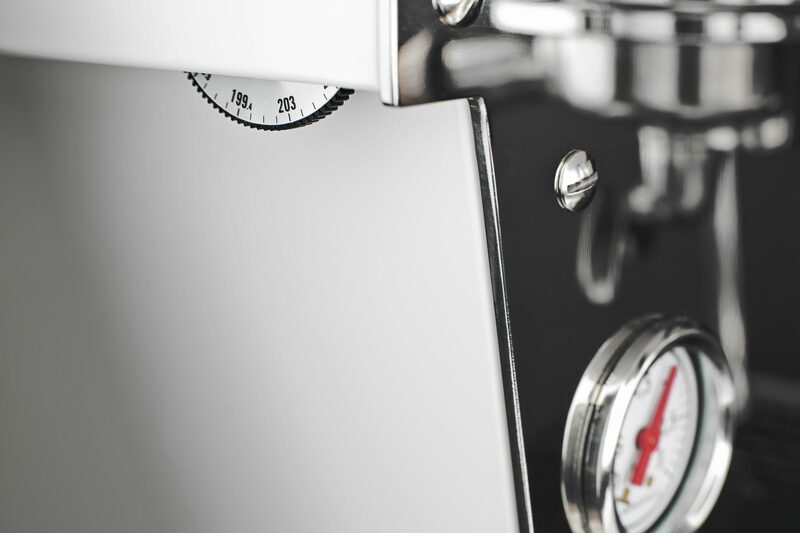 To control temperature, the Linea Mini has a stepped, analog temperature wheel on the left side of the machine that allows for a range of 185F – 221F. 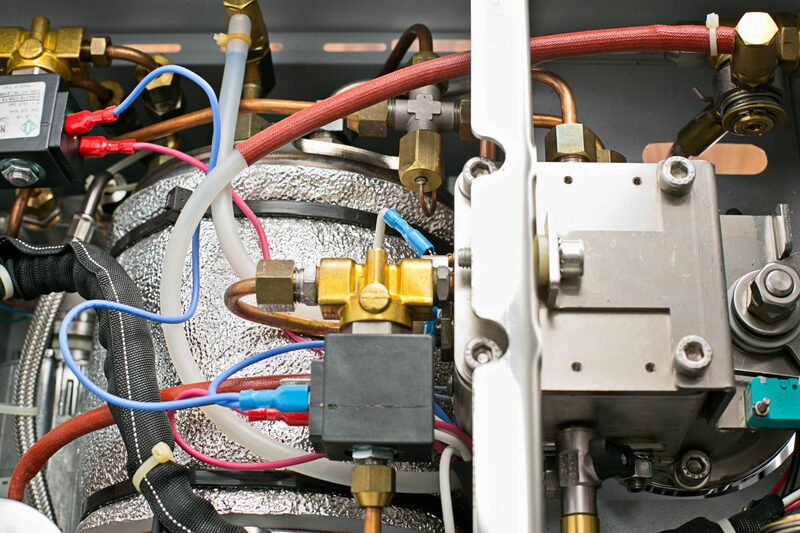 Each click of the wheel raises or lowers the temperature in the boiler by .3 degrees F. Because of the efficient boiler system in the Linea Mini and a digital PID, reasonable changes to temperature happen almost instantly. Tucked on the bottom side of the faceplate, on either side of the grouphead are two barista lights which light up the drip tray when the paddle is turned. These lights illuminate your espresso, turning the drip tray into a stage that allows you to clearly see your shot and pick up on any visual cues you might use throughout the espresso-brewing process. Directly under the brew group is a magnetic drip-tray that is both secure and easy to remove at the same time. This makes accessing the internal reservoir quick & easy. Once the drip tray is removed, the water reservoir slides out—providing an easy re-fill without having to remove the cup grate on top of the machine. 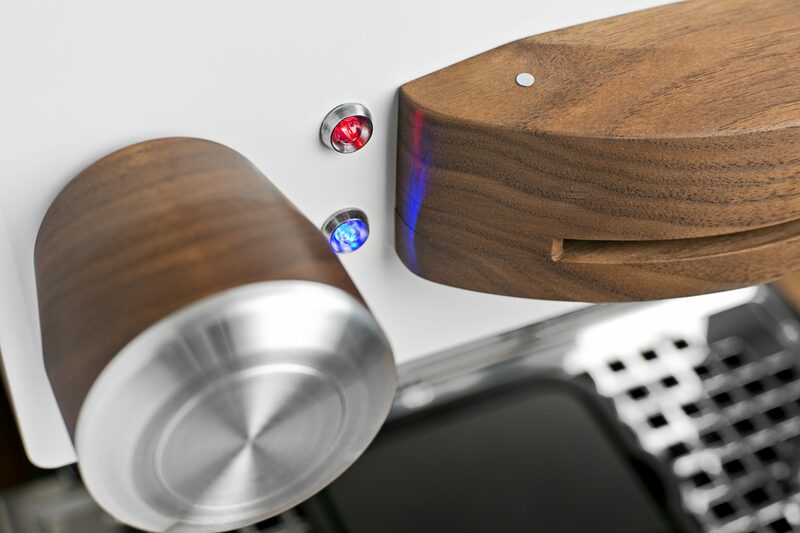 The Linea Mini comes in four colors—red, white, stainless, and black, and can be customized with custom paddles, steam knobs, paddle cover, legs, and portafilter handles. 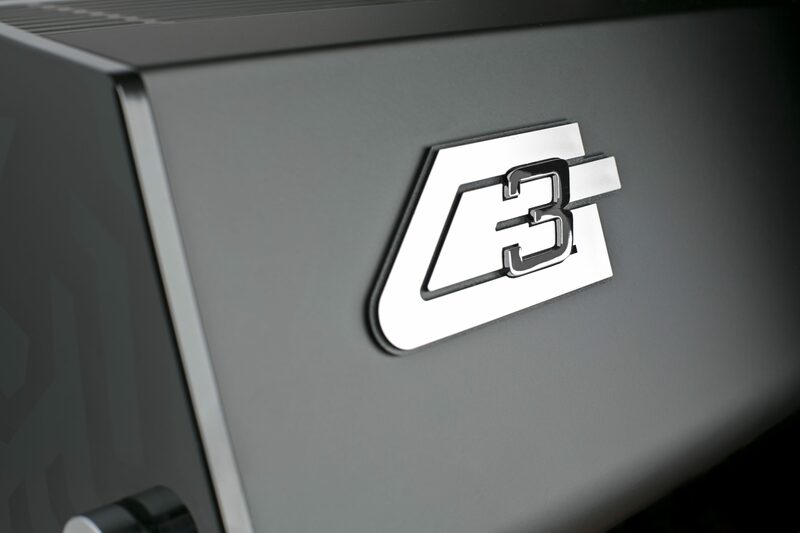 Since 2007, the GS3 has been the standard when it comes to professional espresso machines for the home. While it’s look is based off of earlier GS and GS2 models, the GS3 combines the internals of a Strada and GB5. It was designed and created to provide a full array of tools for even the most avid, detail-oriented home barista. The GS3 comes in two versions—the AV (auto-volumetric) and MP (Manual Paddle). As a platform, the GS3 runs on completely digital controls, and gives the barista the ability to control a wide range of variables using precise settings. Anything from coffee boiler temperature, steam boiler temperature, auto-on & off, half-mode, and PID settings, pre-infusion and auto-volumetrics on the AV. The GS3 was made to be the ultimate home espresso machine, freeing up a barista to explore espresso in any and every way, without worrying about whether the machine could keep up or if it would hold them back, and it’s lived up to that over the years. From off to full coffee-brewing temperature, the GS3 is ready to brew and steam in about 30 minutes. Due to a larger coffee boiler (1.5 liters) with different technology than the Linea Mini, the GS3 is actually heating up more water than the Linea Mini. It runs on 120V of electricity, comes with its own 2.5 liter water reservoir, and has a footprint of 16” x 14” x 21”. Internally, the GS3 holds a 3.5 liter steam boiler and comes with a saturated grouphead—the exact same boiler you’ll find in the Strada. 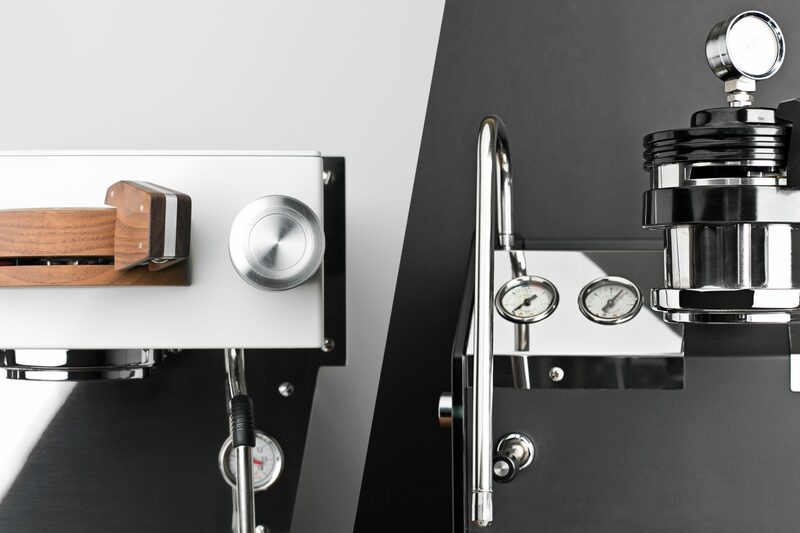 Between the two versions of the GS3, you can emulate almost any style of commercial espresso machine out there, from lever to manual to automatic. 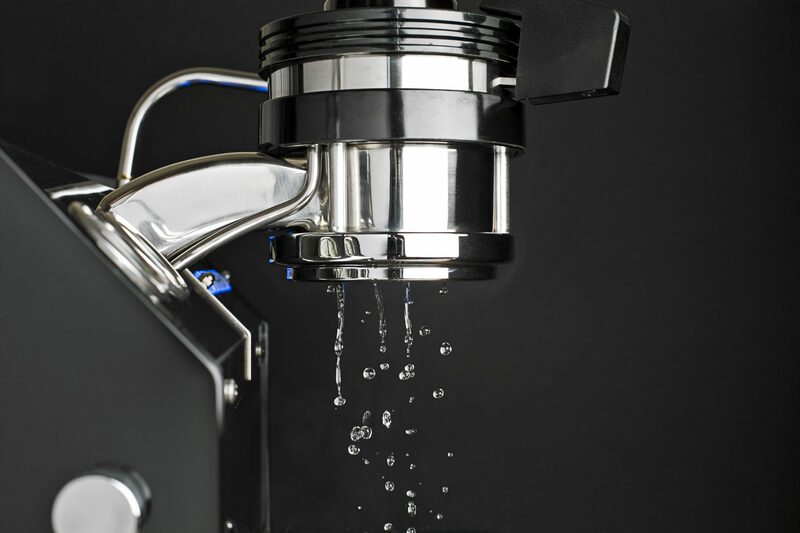 The GS3 AV uses an electronics package that allows for precise & repeatable shots that can be programmed by water volume while the MP gives the user complete manual control over pre-infusion, pressure, and brewing times with paddle valve control—full pressure manipulation at your fingertips. Both versions of the GS3 are equipped with our latest steam-wand technology—the Performance Touch steam wand. The Teflon tube lining the original cool-touch wand has been replaced with a double-walled steel cool touch wand which allows for a higher flow of steam, resulting in faster, more powerful milk steaming. The GS3 AV is a programmable espresso machine, allowing the barista to dial in a shot, and use the controls to consistently repeat a shot. 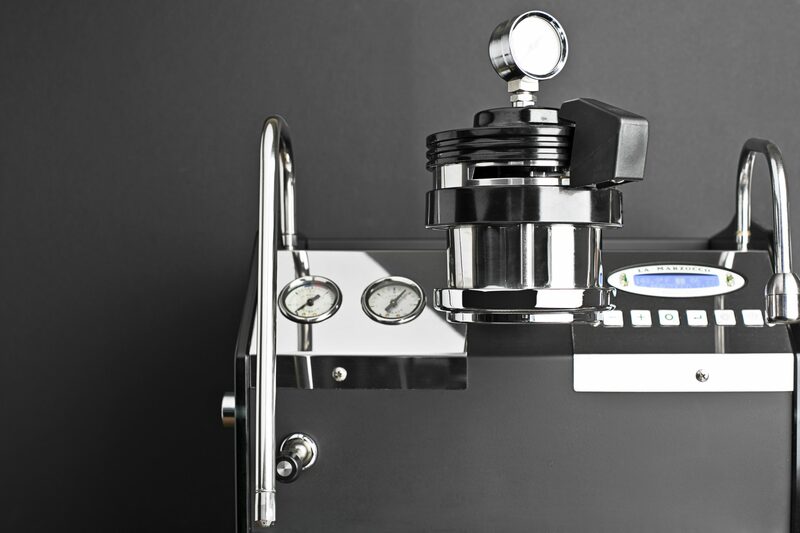 It uses an electronically-controlled espresso system, much the same as the La Marzocco GB5 AV that actuates the pump and the grouphead’s solenoid valve to create the appropriate pressure to extract coffee. This electronic control is what actually enables the volumetric functions of the GS3. Using a small wheel (called a flowmeter), the AV is able count how many times the flowmeter spins when water flows past it, measuring the precise amount of water that passes through the grouphead, and locking it in once the barista is ready to lock it in. From there, all it takes is a push of a button to repeat the same volume out each and every time. If you’ve been following along with us, you’ll know that the ability to program one of the key variables in espresso brewing (volume out) is a valuable tool. Beyond programming shot volumes, the AV gives you the ability to program pre-infusion times into each of the four buttons. Say you’d like to program pre-infusion into your shot, the AV allows you to tell the machine, for example, to pre-infuse for 4 seconds, rest for 5 seconds, then begin brewing. Whether plumbed-in or using the reservoir, pre-infusion is accomplished by quickly engaging the pump for 1-5 seconds (adjustable for each AV preset), then disengaging for 1-5 seconds, then engaging the pump for brewing, which is able to replicate a smooth pre-infusion pressure curve. One final feature of the AV is an automated cleaning cycle. This allows a barista to simply place a blind portafilter basket with detergent in the machine and press a couple buttons—the electronics handle the entire backflush cycle from there. While much of the AV is, well, automatic, you can also use the GS3 Av as a manual machine, simply by pressing the continuous flow button to start and stop the pump. The GS3 MP, by contrast, is a much more manual espresso machine. It was designed to capture the romance of classic espresso making and place control back into the hands of the barista. 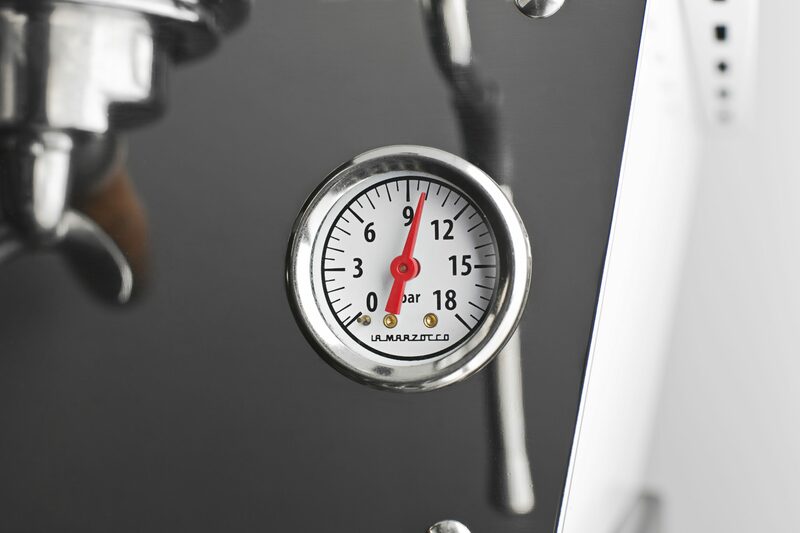 Whatever pressure you want during the espresso-brewing process, whenever you want it. 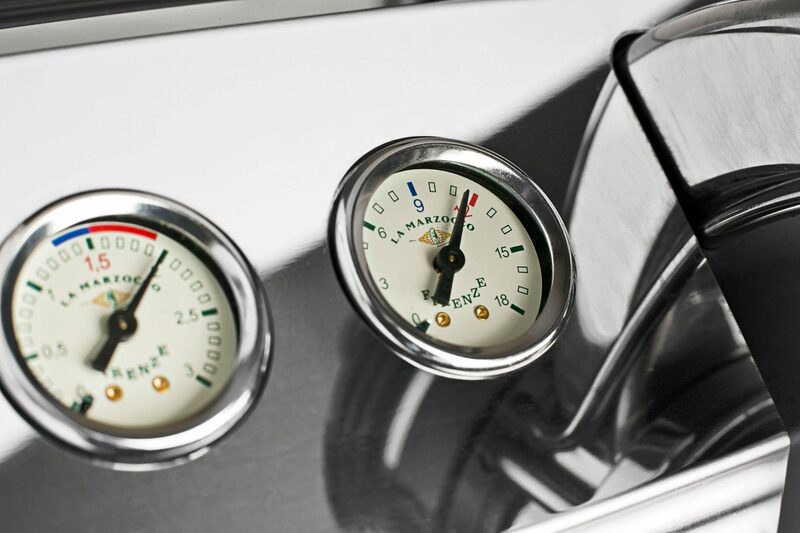 It’s full pressure control at your fingertips—something we’re incredibly excited about. In essence, the paddle places the responsibility for starting and stopping the pre-infusion, pressure, and brewing stages of the espresso shot solely to you. If you want a shot brewed traditionally at 9-bars of pressure, simply turn the paddle to the left. Or, maybe you’d like to pre-infuse at 3-bars, ramp up to 5, then 9, and back down as the shot tails off. You can even emulate a lever espresso machine—ramp up to 3-bars for preinfusion, blast it with 9 bars and slowly trickle down from 9-8-7-6, etc. bars to 0, ending the shot at your desired volume. If you’re an experimenter or tinkerer, this control presents some exciting possibilities with espresso brewing—full control over your pressure on the fly means more possibilities and even more styles of espresso, regardless of what coffee you’re using. This change was introduced in 2016, and the MP grouphead—now in its fifth version—now comes standard with a new conical valve and a grouphead manometer that allows for full-range pressure manipulation with a reservoir or plumbed-in GS3. As the paddle is moved to the left the microswitch is activated, engaging the pump. As the conical valve opens, more water is allowed to pass through, thus changing the pressure in the group. “The MP valve was completely redesigned in 2016 to improve the reliability and longevity of the MP. With this new conical valve, we don’t expect any rebuild to be necessary for up to two years—and in the case of a home user, potentially even longer. In summary the GS3 MP has a conical valve and a grouphead manometer that allows for full-range pressure manipulation with a reservoir or plumbed-in GS3 off of a 110v power supply. We’ve had the luxury of using each of these three machines day in and day out over the last few years, and can truly say you can’t go wrong. Thanks to the consistency and professional-grade build of La Marzocco espresso machines, the decision on which machine is right for you falls less on the machine platform itself and more onto how you’re looking to use your machine. If you like the simplicity of brewing delicious espresso day in and day out, you may find yourself leaning toward the Linea Mini. If programming your shot volume and having digital controls to maneuver your machine and its settings, you may enjoy the GS3 AV. Or, if you’re the kind of person that wants complete control over each and every facet of the espresso-brewing process, you’ll probably find yourself gravitating toward the GS3 MP. You can compare each machine in a convenient, side-by-side way, right here. We’re here to help you navigate which machine might suit you best. We talk to people every day making this big decision, and we feel like we have a pretty good understanding on how you can use these machines. If you have questions about anything related to these machines or purchasing one, don’t hesitate to reach out. Our own Dave Bise is available over email, phone, or through the Intercom chat box down at the bottom right-hand corner of this page. 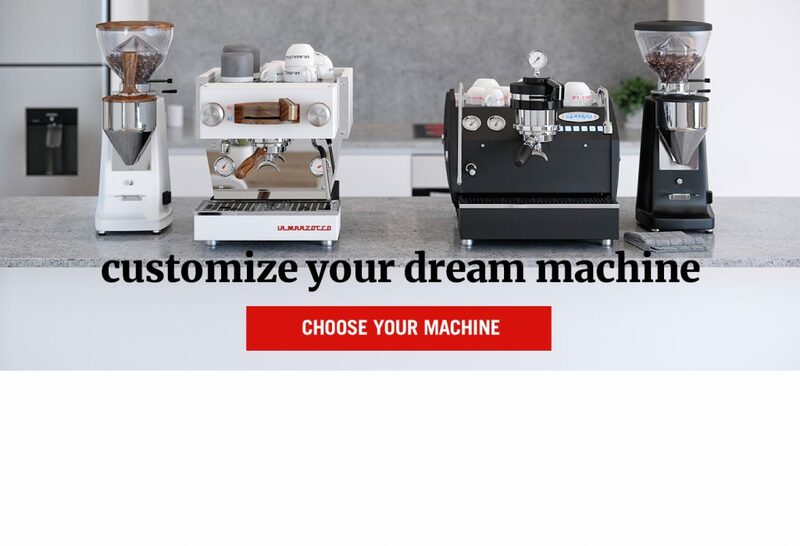 Regardless of your choice of machine, each machine purchased through lamarzocchome.com comes with free shipping and a 13 month parts & labor warranty, as well as access to our Home Espresso Machine Specialist Christopher Scott, and our extensive technical network across the U.S.